And the good news is that you don’t have to settle for Kuerig coffee or Starbucks Via packs while on the road. You can make a truly great cup of coffee easily, no matter where you are in the world. 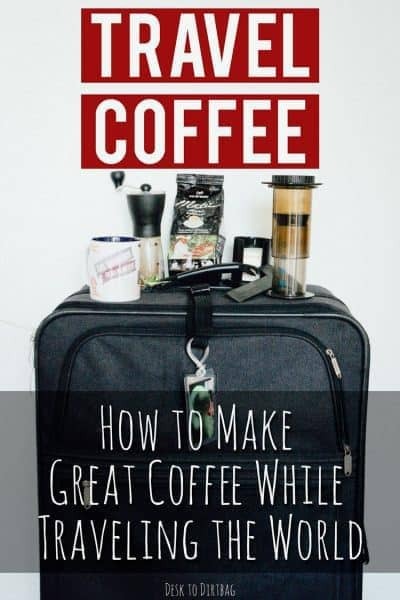 In this article we will talk about the best travel coffee maker, how to ensure you’ve got access to freshly ground beans, and then what can sometimes be the trickiest aspect of making coffee while traveling: obtaining hot water. Whether you are traveling to Boston for a week-long work conference and staying in a nice hotel, or whether you are backpacking across South America for months on end and staying in hostels, remote farms, or camping, you can make an equally great cup of coffee. But in the end I was SO GRATEFUL to have my travel coffee maker and a way to make a delicious cup of coffee no matter where I was. Even though Colombia is one of the world’s best coffee producing countries, most locals there drink instant coffee… The horror! The Aeropress is, simply put, the best portable coffee maker out there, which makes it an obvious choice as the best travel coffee maker. It makes great coffee whether you are in your house, camping, or in a hotel room. The Aeropress isn’t just great for traveling. No, I use it at home on a daily basis as well. I’ve been using it consistently for 4+ years. From remote camping trips, beach side in Mexico, the Colombian Andes, or from the back of my truck in a snowy parking lot in Banff. It delivers the most consistently delicious, fresh, and flavorful cup of coffee with none of the bitterness that you often find thanks to over-extracted or over-steeped coffee. The principle drawback of an Aeropress is that it is best suited for coffee for just one (concentrated) or two people (or Americano style). It is not a good way to brew for multiple cups or a small group, but if you’re traveling, that probably isn’t an issue. 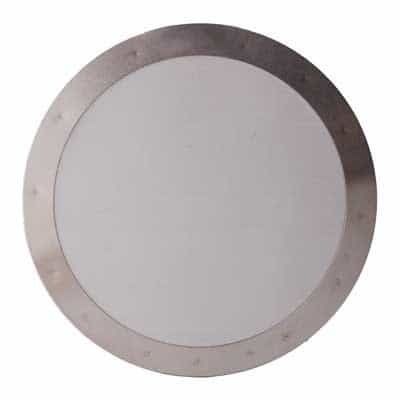 The design is made of durable plastic, so there’s no breakable parts to worry about. Quick and easy to make with steep times as little as 1-2 minutes. Even quicker clean up, just rinse it off, with none of the hassle of something like a French Press. Super lightweight since it is plastic, and the size is pretty small–about the size of a coke can. The Aeropress is an immersion brewing method, but it allows you to control the three key factors that go into brewing a cup of coffee precisely to your personal taste. Many brewing methods don’t allow you to control each of those variables, or those that do allow you to do so (such as a French Press) will often leave behind fine grounds which leave a grittiness or continue to over-extract and turn your coffee bitter. The Aeropress can be purchased for only about $30, and it will revolutionize the way you make coffee both at home and while traveling. 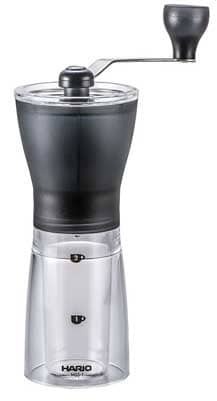 The Aeropress normally uses paper filters, but you can pair it with a reusable metal filter for even more portability. I have the S-Filter from Kaffeologie, and have been using it for well over a year with no signs of wear and tear. The key to a great cup of coffee is freshly roasted and freshly ground coffee. You can certainly buy pre-ground coffee if you want to make your travel life easier. But if you are a purist, you’ll want to freshly grind your beans each morning prior to brewing. No matter where you travel in the world, you can almost certainly find whole beans in any major supermarket in a mid-size to large city. Depending on where you travel some places are much easier than others. You could bring along an electric grinder, but I’d recommend a hand-held grinder simply because of its extreme portability. It sounds like a lot of work, but really it only takes a minute, and I’ve come to really love the morning ritual. I’ve got the Hario Slim Mill Grinder, which has been outstanding and reliable. If packing space is at a premium, you can leave behind the base (which collects the grounds) and just grind directly into the Aeropress. The size of the grinder is similar to the Aeropress, so if pack space isn’t at a premium, it is fine. The Hario is what I brought with me backpacking through Colombia, and it served me well. A better option might be the Porlex JP-30 stainless steel grinder, which fits right inside the Aeropress, so you can consolidate space. I haven’t used it personally, but I’ve heard great feedback from readers, and it is highly rated on Amazon. 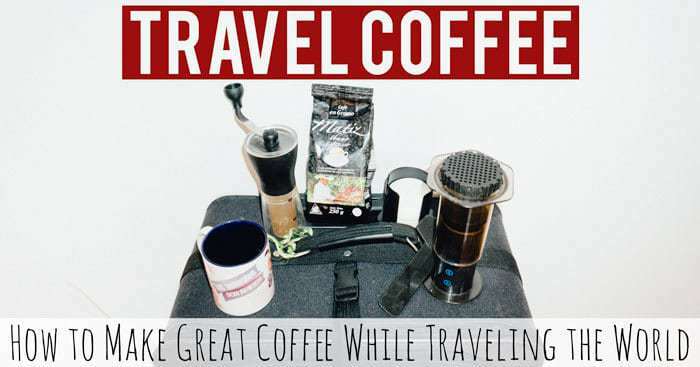 As a traveler, the actual brewing method above with the Aeropress and hand-grinder, is the easy part. The trickier part comes from getting the hot water to brew the coffee. It becomes even more complex depending on the type of travel you will be doing, so I will be running through a variety of different situations and methods. The hotel traveler will at least have the advantage of having access to electricity. Many hotel rooms will have a microwave or an in room coffee brewer (either drip or Keurig). These are the easiest as you can simply boil water in the microwave, or run a cup of water through the coffee machine (with no coffee) to obtain hot water. Although with the latter you may then have water with a questionable flavor or cleanliness. There are many rooms however that don’t offer either microwaves or coffee makers. In that case you’ll need to consider a portable electric source. 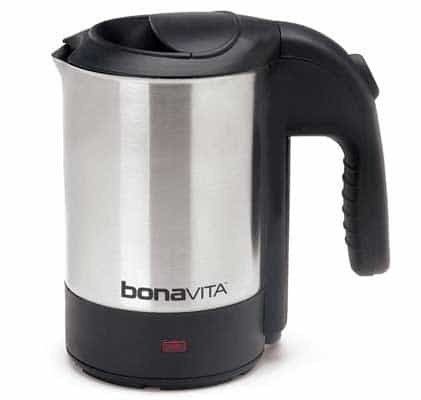 The easiest way would be to get an electric travel kettle so you can quickly boil water in your room. The Bonavita Bon Voyage is .5 liters and is well regarded among travelers. The main drawback is the added bulk in your suitcase. The Bonavita is about 5.5″ around and 7″ tall. Another option would be a simple immersion heater, which allows you to drop the heating element directly into the water. This method is much more portable, but a little slower. There are also some precautions you should take while using immersion heaters, so be sure to read up. 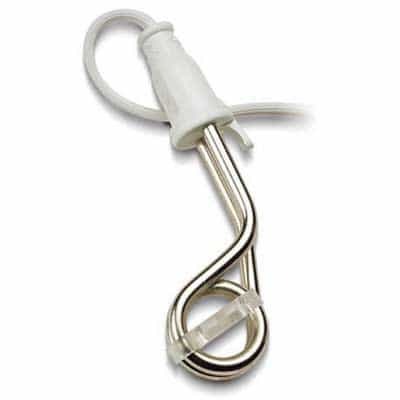 The Lewis N. Clark immersion heater has gotten good feedback from travelers. I travel with a portable hot water kettle and it has been one of the best additions to make my life in budget hotels a little more comfortable. 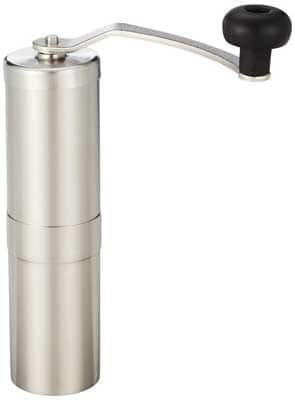 Lastly, rather than relying on electrical sources, you might just consider getting a double-walled stainless steel bottle which retains heat for long periods of time. You can usually pretty easily find boiling water for free at gas stations, restaurants, or even by asking your hotel lobby. I use and love the Hydro Flask bottles and can vouch for their incredible heat retention, even in super cold environments. That way you can fill up your bottle with hot water before bedtime and have water hot enough for brewing in the morning. Incidentally, optimal brewing temperature is not boiling, but rather at around 175 degrees, that way you aren’t burning your coffee. So this method works perfectly. The wide-mouth Hydro Flasks can serve as your portable travel mug as well. I talk a lot about road tripping here on the blog, so if you want to make a killer cup of coffee while on the road, I’d just recommend getting a Jetboil canister stove for your hot water needs while on the road. I’ve made incredible coffee from my tailgate in the middle of nowhere. The Jetboil is an incredibly fast and reliable stove. If you’re going to be living out of a backpack, staying in the city in hostels, or WWOOFing on remote farms, or camping out in nature at times, then your situation is a bit different. Above all you need to prioritize both size and weight, ensuring you don’t overpack. In hostels you have the chief advantage of having access to a kitchen where you can boil water on the stovetop, or perhaps in an electric kettle or microwave. Hostel coffee is about as easy as it gets, even more so than hotel stays. The tricky part are those more remote, off-the-grid situations. What I would recommend above all else, is traveling with a small titanium pot and making yourself a simple and free alcohol stove. This applies if you are going to spend any considerable amount of time off the grid. If it’s few and far between, than maybe it isn’t worth it for you. Titanium pots are nice and lightweight, you can pack things inside of it, and you can also save money by cooking a bit of your own food while traveling in certain situations. The alcohol stoves are amazingly functional, and like I said, totally free. Just buy a can of coke and then make the stove. You can use it when you need and then recycle it when you head back to the city (not that they weigh much or take up much room in your pack). Alcohol, not the kind you drink but rubbing alcohol for instance, can be found all over the world for just a few dollars. Buy a small bottle before you go off the grid and you’re all set. There is plenty to be said about different alcohols and stove designs, but that is beyond the scope of this article. You can buy some really nice alcohol stove kits, that are super lightweight and portable. These stoves are what many Appalachian Trail thruhikers use day in and day out. I personally own the Ti-Tri kit from Trail Designs which be used as an alcohol stove, a wood burning stove, or with Esbit tablets. 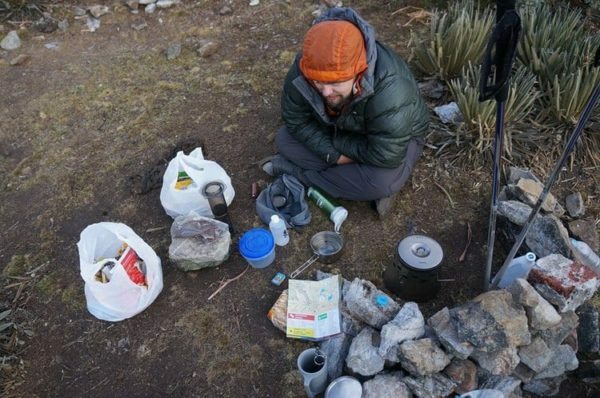 All this is to say that I’ve hand ground coffee and boiled water with an alcohol stove at 13,000 feet in the foothills of the Andes and still had my amazing cup of coffee. So there you have it! No excuses now to settle for Keurig coffee or that instant stuff. Your travel coffee maker kit may take up a little bit more room in your luggage or pack, but the size and weight is minimal, and the simple pleasure of a great cup of coffee every morning is definitely worth it, especially when you are roughing it while traveling. Please take a moment to share this post on Facebook, Pinterest, or Twitter. What a great article with so much detail! Great job!! 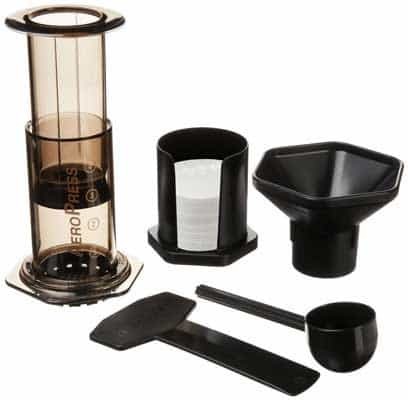 In addition to the great features you mention above, your readers might also find it interesting that the Aeropress doesn’t take up a lot of counter space. We thought that made it even more attractive. Best of luck with your web site! !